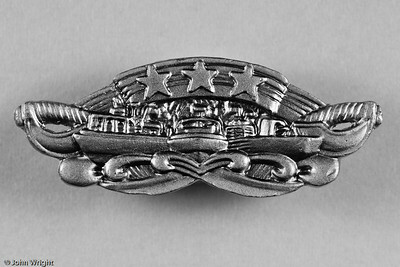 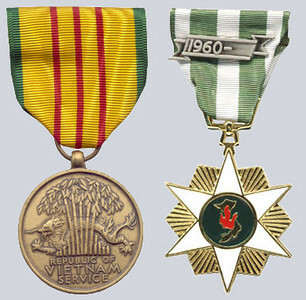 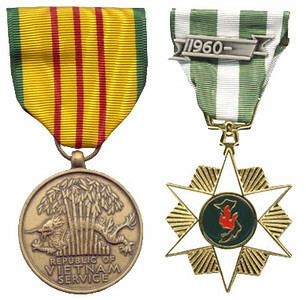 Ribbons reading left to right, top to bottom: Navy Unit Commendation, Navy Meritorious Unit Commendation, Naval Reserve Meritorious Service Medal (three awards), National Defense Service Medal, Vietnam Service Medal (six campaigns), Humanitarian Service Medal, Armed Forces Reserve Medal (two awards), Republic of Vietnam Cross of Gallantry Presidential Unit Citation, Republic of Vietnam Civic Actions PUC, Republic of Vietnam Campaign Medal and US Navy Rifle Sharpshooter. 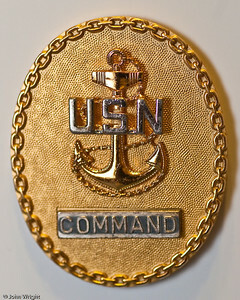 US Navy Enlisted Expeditionary Warfare Note: This qualification was originated in 2006, well after I retired and there is no grandfather clause. 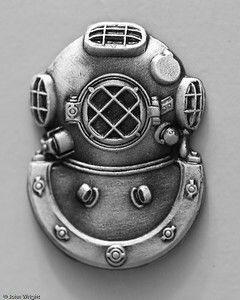 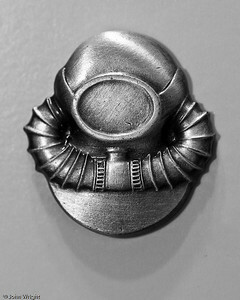 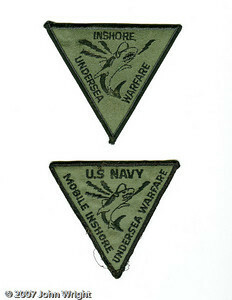 I've put it here because the Mobile Inshore Undersea Warfare and diving units I served with would have allowed me to qualify for it. 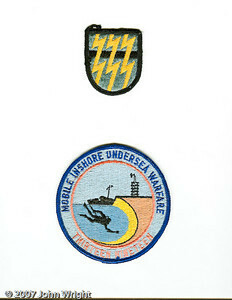 US Navy Mobile Undersea Warfare, new and old. 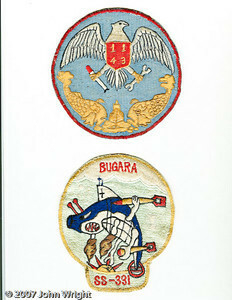 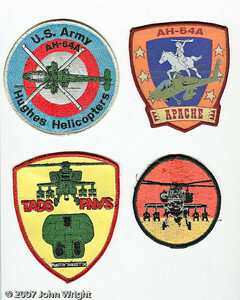 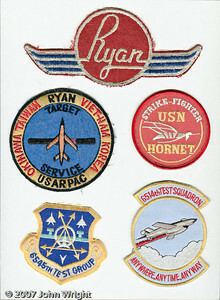 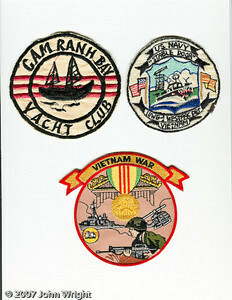 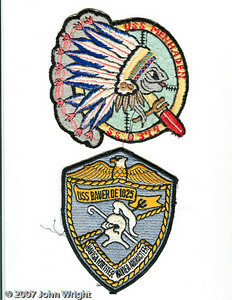 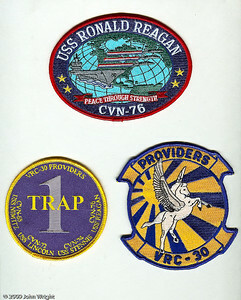 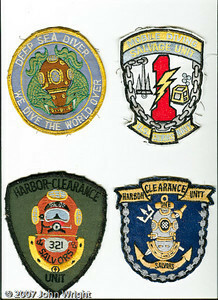 USS Ronald Reagan (CVN-76), One-trap patch from VRC-30, VRC-30 "The Providers"
"Cam Ranh Bay Yacht Club;" Inshore Undersea Warfare Group 1, Westpac Detachment; generic Vietnam War patch. 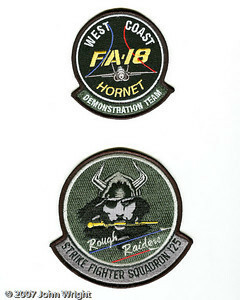 Strike Fighter Squadron 125 (VF/A-125) and West Coast F/A-18 Demo team.